This week I had the honor and privilege of serving as a juror for my local county. In some ways it was exactly like the movies and TV shows. In other ways, quite different. There was no background music unfortunately. Also, they only selected 6 people instead of 12. They started out by putting us in a random order. I happened to be #6 on the list. Then they only asked general questions to the entire group of 50 people. One of the guys in front of me happened to know one of the witnesses (the defendant shared the same doctor). They never actually asked me any direct questions. This took about 30 minutes. The lawyers and judge chatted in the chambers for about 5 minutes. They came out and announced the set of jurors - and I was one of them. After everyone else left we proceeded to opening statements where I learned that the defendant was being accused of driving under the influence of alcohol where he failed his field test (after being pulled over for speeding on his motorcycle). BUT it turns out that he also had been in an accident months earlier where some brain trauma and coordination issues remained. So... did he fail the test because he was drunk? He did admit to drinking one beer 10 minutes before being pulled over. Or, did he fail because of prior health issues? Further complicating things: he took a breath test at the jail house one and a half hours after being pulled over where he blew a 0.07 BAC and in Oregon you need to blow a 0.08 or higher to be legally considered drunk. It was up to the 6 of us to decide this man's fate. We then started with witnesses where the first was the police offer who pulled the man over. In addition to his verbal testimony and written report, we also got to watch a video of the entire event. Pretty cool! They explained what happened. Then play that part of the video, then ask clarifying questions. Having the actual video was very helpful. Then came the cross examination which was pretty cool because that ended the rehearsed part. Overall, I thought the officer did a good job of explaining what happened. You could tell that he's done his job for a while and knew what to pay attention to. I actually thought that entire questioning process was extremely fair because both sides got to continuously ask questions until everyone was satisfied. We also listened to the testimony from a CSI who explained how alcohol works its way through the body. We also heard from the man's doctor who explained that because of his prior injury he could not complete the physical field tests. We heard from many people who described the man as acting the same way during regular hours without alcohol as the way the police officer saw him. It's strange. Everyone seemed to agree that he was impaired to the point where he should not have been driving, but the reason why was critically important. An injury doesn't count, but alcohol does. I also needed to constantly remind myself that I wasn't being entertained. This wasn't Law & Order and I wasn't evaluating the attorney's presentation skills. Instead, I was there to discern the facts and determine if he broke the law beyond a reasonable doubt, even if I didn't agree with the law only using the information presented to us. This was a very difficult feeling to shake. The entire process took two and a half days of selecting, testifying and deliberating. In the end, we came to a unanimous decision. I did what I do best: I created a framework the group used for determining what happened. We then put the evidence into the framework and evaluated. By the time we finished it became very clear, even after discounting his physical issues, that he did indeed drive under the influence of alcohol. Another difference between reality and TV was the amount of information we get. Usually the show is from the lawyer's perspective where you, as the viewer, know all the facts (even what couldn't be shown), what's trying to be proven and what's on the line. For example, I have no idea what his penalty is. I can guess from reading about it generally later online, but I don't actually know because the judge took us out of the room for all of those discussions. 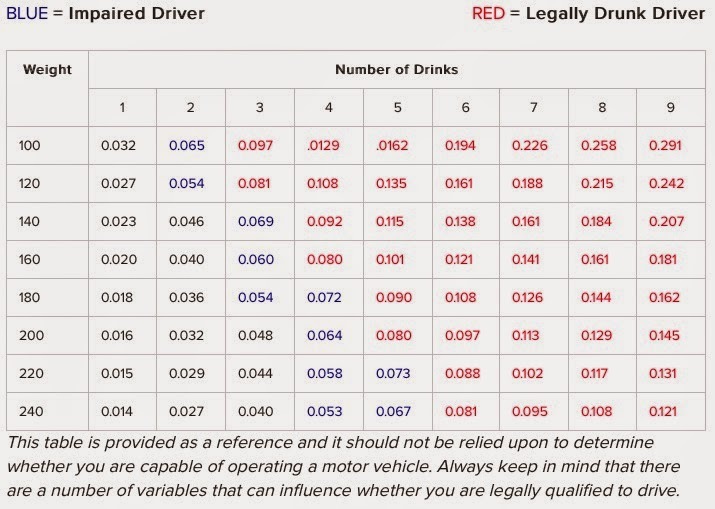 I also later looked up a BAC chart to see if 1 beer would get a 190lb man anywhere close to .07 BAC. The short answer is no. So clearly he was stretching the truth when he said he only had 1 beer. I don't know why they didn't use a table like this. There were other pieces of evidence I was surprised weren't included. I guess that's because including more evidence and witnesses takes more time and money that just may not have been worth it given the penalty. "Your public service as a juror is one of the most important functions of our democracy. A right to a trial by jury is guaranteed by both the Oregon and United States Constitution and is a cornerstone of freedom and justice. You should not view your jury services as an obligation but an exercise of your right to participate in government. Your service assures the fairness of the judicial system and is a safeguard of the freedom we all enjoy. Thank you for your service." The Rat Race is a term used for an endless, self-defeating or pointless pursuit. Think of the futile efforts of a lab rat trying to escape while running around a maze or in a wheel - it expends a lot of effort, but ultimately achieves nothing meaningful. We, James & Jessi Furlo, attempt to live our lives outside this rat race by being purposeful and meaningful, and celebrating those successes on this blog. There are many aspects to living life outside the rat race: Spiritually, socially, and financially. Also with our family, work, play and health. You'll find all of that here. So yes, this is a personal blog and is full of various ideas and thoughts. It's also entertaining and inspirational on occasion. We're glad you decided to share in a piece of our success and story.